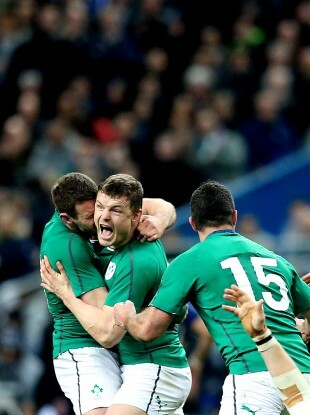 Brian O'Driscoll celebrates Ireland's Six Nations win in Paris. THE END IS nigh but Brian O’Driscoll has one last final to give his all in. Ireland’s greatest ever centre will end his playing career on Saturday as Leinster host Glasgow Warriors in the RaboDirect Pro12 final. We spoke with Fergus McFadden [Leinster and Ireland] and Paul Warwick [former Munster player] on O’Driscoll’s legacy, the changing nature of centre play and how players are adapting to the physical demands of the position. I definitely think players are getting physically stronger and bigger. I look at the kids coming through [at Worcester] and it is probably the first time I’ve had that ‘I’m a grandpa’ feel. There are 18 and 19-year-old kids who are probably 6′ 5″ and 120 kilos. Especially in the southern hemisphere rugby that I came through, it was more about your evasive skills and your intellect. Whereas play, particularly forward play, is about winning collisions. The bigger and stronger you are, the more you help your backline to go forward. That’s where the game is at the moment. You’ll see it in any highlights package — tackles are getting bigger, impacts are heavier and injuries are certainly greater. The game has moved on and if you think of someone like O’Driscoll, I don’t think we’ll see too many people having a career like he did. At the top level its intensely competitive and physically demanding. I don’t know O’Driscoll personally but he certainly deserves to go out as a winner. I couldn’t imagine that he would expect all the accolades he is getting. Irish players of that era are very humble and pretty grateful for their careers. For me, John Hayes is the best example of it. You won’t see him anywhere near anything to do with Munster now because he’s had his time in the sun and is not looking for any recognition. I’m sure Brian is the same but he has been a fantastic ambassador for world rugby and it would be a shame if the public were not to see him off, as a winner, in his last game. I think there’s a balance… you can be a weightlifter and you can be an athlete. You’re trying to get a fine balance between having strength and having speed as well. It’s important for me to be fast and agile on the wing. You can be a big lump, but if you’re slow and not good at moving laterally, not good on your feet, you’ll get shown up in that area. So it’s about having the balance and I think we’ve got the right guys getting us stronger and faster. I think when you’re coming up through the academies, you are getting stronger and stronger each year. They’re only tiny margins after that where you’ll make gains and losses in. Look at someone like Drico; he wouldn’t have lifted really heavy weights over the last few years. The game has taken its toll on his body and it’s more about maintenance, he just kind of adapted to it in that way. It’s funny, back in the day, when there might not have been as much emphasis on strength and conditioning, you would have seen guys with scrum caps or massive shoulder pads. But, these days, you don’t really see guys wearing pads any more, because players over time, whether in academies or going up through set-ups, you build up mass with the muscle and you get used to taking those collisions. After really big games you are sore on Monday and Tuesday, but it’s a process you go though and you just get on with it for the following week. I think the collisions each year are getting heavier and worse and all you can do is adapt and go with it. Matt O’Connor has spoken about pursuing a replacement centre for O’Driscoll but moves to bring in Robbie Henshaw and Jared Payne appear to have been unsuccessful. Luke Fitzgerald would be the choice of many Leinster fans but he has been plagued by injuries. O’Connor may give McFadden a run in the 13 jersey next season while other options include Zane Kirchner, Brendan Macken and moving Gordon D’Arcy into the position. Here are some foreign options that Leinster could pursue. Who do you think will start next season in Leinster’s No.13 shirt? Email “Will we ever see the impulsive, electric likes of Brian O'Driscoll again?”. Feedback on “Will we ever see the impulsive, electric likes of Brian O'Driscoll again?”.